There have been a lot of questions sent to use regarding what we think the best gun cleaning solvents are. In this review, we’ll take a look at the most popular options used by the pros. 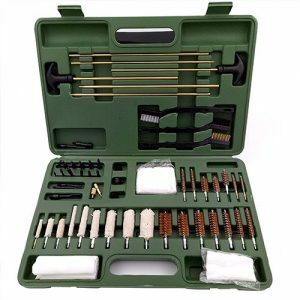 The vast majority of gun cleaning kits do not include a gun cleaning solvent, so you will need to purchase this separately. When looking at gun cleaning solvents you need to consider several important factors. A quick clean with a bore snake will only require a dab of CLP to clean your firearm. However, doing a full clean will require different oils and cleaners and we will cover the best gun cleaner lubricants and protectors and you’ll learn why they are the best. If you are using a bore snake kit you will find that it already comes with these two cleaning solvents. If you are not using a bore snake and purchase a gun cleaning kit you’re going to have to buy these two solvents separately. Just Needing a Quick Look? Why is Hoppe’s known as the best bore cleaner? Hoppe’s No. 9 is the most widely used remover of powder, lead, metal fouling and rust. Hoppe’s have been making bore cleaning solvent for over 100 years, so the pretty much have this down to a science. Most people like to use this along with a CLP to clean their firearms. Many people only use this solvent, rather than using a CLP and find it works just as well. We have used several different CLPs over the years and by far, Hoppe’s is the best bore cleaner and has been the best for over 100 years. One of my favorite things about this bore cleaner is the smell. It’s probably one of my favorite smelling oils of all the cleaning solvents on this list. The main use for the Hoppe’s bore cleaner is to use with a boresnake. Boresnakes are not included in gun cleaning kits but they are essential for cleaning your gun quickly. After you fire your gun you should use a boresnake with some of Hoppe’s bore cleaner. This is called a quick clean and only takes about a minute. Over the years we’ve tested just about every CLP looking for the best gun cleaner spray and many people swear by the Break Free CLP and say that it’s the best gun cleaning aerosol spray that they have ever used. It has been a VERY popular choice for years and there have been nothing but positive reviews. In fact, it’s the most popular CLP used by the US Army to clean all rifles, pistols, and even tanks! Break free comes in either aerosol spray cans or spray bottles. Most people prefer the aerosol spay with the little straw on the end, to target individual spots. This CLP has a very high weather tolerance and works in all conditions, which is probably why it’s become so popular. This spray CLP stands for Clean, Lube, Protect and that’s what this Sage & Barker solvent does. Many of the people I know swear by this solvent and I personally use it. This solvent cleans like nothing I have ever used and smells great. What used to take me 10 minutes with other solvents, takes about half the time with this CLP. It works perfectly with bore snakes or on brushes for a full clean. If your firearms are notorious for attracting dust, like mine are, these this solvent is a miracle worker. It somehow stops dust and at the same time cleans and lubes all in one pass. No harsh smelling chemicals that will not damage the blueing and finish of your well-loved firearms. Non-Hazardous, biodegradable and non-toxic, so you can feel good that cleaning your firearms isn’t damaging our environment. Normal CLPs oil can attract dust and sand. With this in mind we went to work on the most effective CLP to come to the market that significantly reduces adhesion of debris to your firearms surface. Coats and protects the bore and all moving parts on your firearm. Our CLP provides working components of the firearm improved heat dissipation resulting in cooler weapon operation temperatures. It’s a hard choice between the Break Free and Ballistol for the title of best gun cleaner spray. Both are similar and have been used by many for decades. The Ballistol multipurpose spray gun cleaner was first developed for the German Army over 100 years ago by German scientists, Ballistol may be the best gun cleaning solvent ever designed. The scientists worked on developing a formula that would be a Universal cleaning formula for cleaning all weapons. People who use this swear by it and claim that this solvent is the best gun cleaner spray and worth its weight in gold. Many people not only use this for their guns but for cleaning and protecting their boots, knives, cases, packs, clothes, engines, wheels, etc. It’s designed to be non-toxic and has a great earthy smell that is very enjoyable. A good friend of mine uses this and he says it’s the best gun cleaner spray that you can find. Many people who I have seen in videos also say this and the secret recipe seems to only be used by Ballistol, originally used by the German scientists. When searching for the best gun cleaner and lubricant found many that didn’t live up to the expectations of the gun owners. Everyone that has used this gun cleaner lubricant has had nothing but good things to say about it. So what are they saying you might be thinking? The great thing about the Slip2000 is that it’s rated for extreme weather conditions, making it the best option if you’re going to be in very cold or hot climates. Other CLPs don’t work as well in extreme cold and the aerosol canisters may not function properly. When the weather is too cold the solvent will turn into goo and become nearly impossible to clean. We always try to ask other shooters what cleaning kits and lubricants they like the most. We were surprised to find that a lot of them are turning to this particular lubricant and only this lubricant. 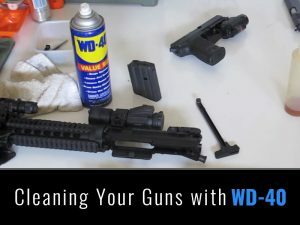 We have seen many youtube videos regarding gun cleaning kits, cleaning guides and CLP guides and the one lubricant that keeps popping up from some of the top gun instructors is this one. Lucas gun oil is the popular option for many hunters because it’s odorless. This oil was developed to preventing jamming and over-heating in large high-caliber rifles and machine guns. All it takes is a couple of drops on the bolt of your pistol or rifle and you’re good to go. Like most CLPs you don’t need a lot and one small bottle can last a long time. A very inexpensive option for any gun owner, be sure to note that this is not a CLP and should only be used for lubricating your firearms after you are done using your CLP to clean. It acts as a lubricant and protector, so a popular option is to use the Hoppe’s for cleaning and the Lucas Oil for the second part of your cleaning. We’ve gotten a lot of questions regarding which oil is the best gun cleaning oil out there. 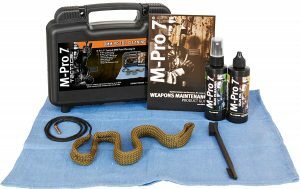 Many people love M-Pro products and use this solvent along with the M-Pro bore snake. I’ve been using their oil and the protector for a few years and they are one of my favorite. Designed to work in all-weather conditions this oil is a favorite for many. It acts as a lubricant and protector, so you will need a separate cleaner. A few people who I’ve spoken to who have tried this didn’t like the bottle that it comes in. They said it leaked out into their carrying case while it was upside down. Maybe they should have tightened it better but that’s not really a risk I want to take. Other than the quality of the plastic bottle this is some amazing LP. This is Amazons #1 Pick for the best gun cleaner lubricant, so we have to include it on the list. A very popular option, in a perfectly designed bottle with tight child proof lid. One of the most common CLP combos is this along with the Hoppe’s No. 9 Gun Bore Cleaner and the Cotton Swabs with Wooden Handles (Pack of 100). 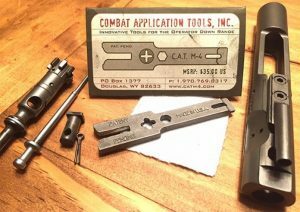 This is by far the most popular CLP we have seen in our years of gun cleaning. What makes this one so popular? Hoppe’s has been around for a very long time and have developed a huge variety of different gun cleaning solvents which you can find on their website. They are a trusted brand and their products are really some of the best, especially their bore cleaning and lubricating oils. Many lubricants are non-synthetic making them a bit different from this one. Many people swear by this synthetic compound which has been a popular Hoppe’s product for over a century. They have been improving and testing the compound for a long time and it really is one of the best lubricants and protectants. When storing your firearm after cleaning you want to use the best gun grease to preserve it for a long time. When you purchase a new firearm often times you will find that it has a light coat of grease on all of the metal parts. This helps to prevent corrosion that can build up while on the shelf in the store. If the gun is in the original box you can assume it’s been greased by the manufacturer. Most gun stores will decrease the gun before selling it. The point I’m trying to make here is that grease is designed to protect your gun for long-term storage. The Tetra grease is colorless and is meant to rub onto your gun before you store it away. It has a strong odor however the small will fade in about 24 hours. This grease is mainly designed to be rubbed onto firearms that will be stored for long periods of time. The reason why oils are not recommended is that over time oil will begin to evaporate or harden which will end up damaging your firearm over time. With grease, you won’t have this problem and it can remain perfectly oiled for several years. However, once you wait to use the gun it’s recommended to remove the grease and give it a good clean with a CLP. Many people like to include a needle oiler in their gun cleaning kit. This is the best needle oiler we could find and it was a tough pick between this and hoppe’s. But we are getting tired of putting all of hoppe’s products on our list, so we thought we would check the competition. For the most part, people can’t tell the difference between this and the hoppe’s, other than the price difference. This one is slightly less expensive and has a nice red liquid and better needle. Not only does this protect but it also cleans and lubes the parts of your gun that you touch with this needle. This is designed for hard to reach spots and many people like the design of the needle and bottle and purchase it just for that and then replace it with the CLP of their choice. While it’s not very difficult to pick out a good cleaning solvent, there are so many to choose from that it can be confusing. 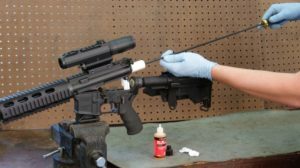 We hope that our Top 10 List answers most of the common questions but we wanted to give a few other tips and tricks when it comes to choosing the best gun cleaning solvent. While cleaning your firearm, you should be using a good gun vise to secure it. While it’s not completely necessary, it will help prevent you from scratching the inside of the barrel and damaging other parts of your guns. Don’t make the mistake of using a traditional bench vise, as this can EASILY damage your firearms. Using a good gun cleaning mat can also help you save your surfaces. If you leak CLP all over your wooden table then you may find it pretty difficult to get it off. Anything to cover your expensive surfaces is always a good idea. It’s simple to make DIY gun mat for a few dollars and can end up saving you a time and money when that bottle of CLP tips over and spills everywhere. Always check to make sure the cap is on extra tight. Many people often complain to me about their CLP leaking all over their gear and it can ruin it because it’s hard to get out. This can simply be avoided by tightening the lid or making sure the bottle is not upside down when you pack it away. Use some plastic bottles that don’t leak and label them. I like to do this because you can store several smaller cleaning solvent bottles in one storage box. 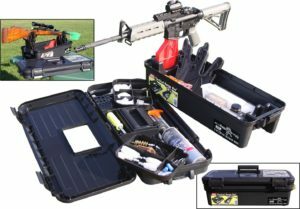 If you plan to take your solvents with you when you go shooting, you should always keep them in a good gun cleaning box. This can be something as simple as a tackle box or your gun cleaning kit bag. Many solvents have been known to leak, which is why it’s important to keep them separate from your every-day gear. One of the biggest things to consider with all CLPs is the climate. If you carry along an aerosol spray into the freezing cold, then you may find yourself with a few freezing problems. The type of CLP you use should be suited to the climate you’ll be shooting in. The majority of all solvents listed on this page work in extreme weather conditions but not all of them are designed for it, so be sure to double-check. Different solvents are made for different firearms. If you’re cleaning an antique black powder pistol worth $5,000 then you may want to pay extra close attention to your solvents. The majority of these solvents are designed for typical modern firearms. However, they will work for older firearms and you shouldn’t have much to worry about. You want to protect your gun from the elements and make sure that it will fire when you want it to. This is the purpose of a gun cleaning solvent. Some solvents are better than others and some are designed to do specific things. We try to provide a little bit about each different solvent, so that you can make an informed decision. While we have are personal favorite solvents, we don’t want that to reflect your decision-making process because there are so many out there that I have not had a chance to try them all. 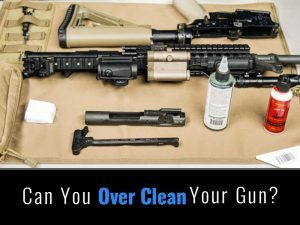 Keeping your firearm clean using a good cleaning solvent (CLP) is probably the best thing you can do. As well as taking the time to use a proper gun cleaning kit to clean it on a regular basis. You need to prevent moisture buildup and condensation. If your gun is moist and you let it sit on a shelf or in a safe for a few days, you’ll find that it can quickly rust. Any water left on your gun is a very bad idea and can quickly ruin it. Our Verdict: What’s the Best Gun Cleaning Solvent? We took a vote last month at a gun club I belong to and here is the result. The overwhelming majority of our members have been using the Hoppe’s Bore Cleaner for many years and have become very attached to it. While It should be used in combination with other solvents, since it’s not technically a CLP – It is the best bore cleaner. However, it’s only a Cleaner and not a Lubricator or Protector. I have known a few people that use it as a CLP and their guns are just fine but I like to use the aerosol sprays. Break Free is my choice and I have been using it for many years and it’s never failed me. One small can of this stuff can last you about 2 years and it’s one of the best aerosol CLP sprays out there, hands down. Choosing the best gun cleaning solvent is very important if you want your firearms to perform at peak performance. Don’t just go with the big name brand products and hope for the best because there are new products coming out all the time that are using new technology. We hope that be reading this list of gun cleaning solvents you learned a thing or two. 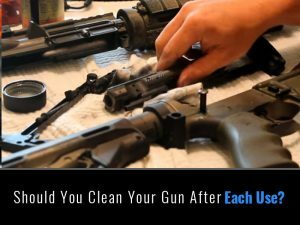 We learned that there is no all in one best gun cleaning solvent and you may need to use several solvents to keep your guns clean depending on your needs.